Zainichi Korean (Korean Resident in Japan) has living in Japan since 1910. In 1945, the emancipation of Korea from Japan after, a lot of Korean did back to motherland, however, about 600thousand Korean people had lived in Japan after emancipation. They couldn’t went to motherland, because they don’t had a money what Korea – Japan ship had moved in a part of place, so they should needed go to where. In 1948, two countries are found in Korean peninsula that is Democratic People’s Republic of Korea (D.P.R.K.) and Republic of Korea (ROK). They motherland was cut by cold war regime. In 1954, D.P.R.K. government was announcement to Zainichi Koreans “You are our country citizen”. At the next year, Chongryong (the General Association of Korean Residents in Japan) to be organization in Tokyo what support to D.P.R.K. as motherland. In other side, some Korean made group of ROK supporting as motherland that is Mindan (the Korean Residents Union in Japan). In 1965, ROK gave ROK citizenship to Zainichi Koreans by Treaty between ROK – Japan however, ROK did a few supports only to Zainichi Koreans. D.P.R.K. was different. D.P.R.K. sent money to Zainichi Korean for founding of Korean School. And D.P.R.K. leader Kim Il-Sung encouraged repatriation to D.P.R.K. 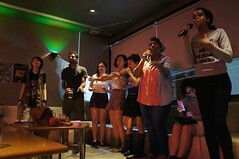 A lot of Koreans had sympathy to D.P.R.K. At the same time, Japan government disliked Korean, because they ware left wing and they had sympathy of communism. GHQ (reigned over Japan for 1945 – 1951) had same opinion. In 1959, D.P.R.K. – Japan negotiated on repatriation of Zainichi Korean, when D.P.R.K. and Japan agreed they opinion; Japan want removal Koreans, D.P.R.K. want manpower for country building. In this time, Repatriation Program was planning. 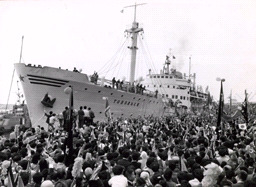 December 14th 1959, Ship of Repatriation departed from Nigata port that taken about 900 Koreans. This time after, about 60thousand Zainichi Korean went back to “motherland”, however a lot of Zainichi Koreans real motherland was the present of ROK. That was continued in 1980s. Zainichi Korean had kept “Dream” and “Hope”, because D.P.R.K. government did statement “our country is a paradise on the earth”. And, if they had continued living in Japan, they might have given discriminations from Japanese and Japan government. Practice, a lot of Korean is giving discriminations from Japan. In that situation, they thought dream and hope to D.P.R.K. ← How do you think about citizenship?